Previous economic downturns have seen increased public support for spending on welfare. But the recent crisis was accompanied by a decline in sympathy for those on benefits – particularly among the young. Daniel Sage assesses the evidence. Recent proposals for benefit reform have centred upon the argument that at present many people feel they get nothing for something from the welfare state, while those on benefits reap the rewards. The rationale behind these proposals is twofold. The first is that the erosion of universal benefits and social insurance means many people feel they now get little welfare bang for their income tax buck. This is the argument for self-interest: people like welfare when they get something from it. The second is that heavy means-testing has created a dependency culture in which many claimants do not want to work. This is the argument against solidarity: that the public are less willing to help benefit claimants because they perceive them as undeserving. But what if there is another cause of attitude change? And thus, what if the solution might be much, much different? The graph below shows the percentage change (1987-2011) for those who agree with three long-running questions from the British Social Attitudes series relating to the benefits system. Importantly, the graph is broken down by age-group. The first conclusion we can draw is that there has been a uniform shift against support for the welfare state. However, by far the largest shift in negative attitudes was among the youngest age-groups – 18-34 and 35-44 year-olds. 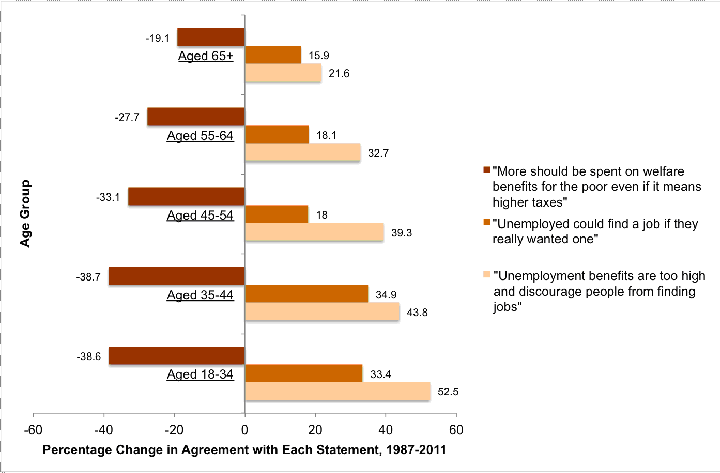 Amongst 18-34 year olds for example, the belief that ‘unemployment benefits are too high’ rose 52.5 per cent between 1987 and 2011. For the over-65s, the corresponding change was just 21.6 per cent. Age is not the only demographic factor associated with attitudinal change. Labour supporters, for example, have shifted their views much more rapidly than Conservative ones. Similarly, people in Northern England, Scotland and Wales have ‘caught up’ with those in the traditionally more conservative South. Conservative sympathisers and southerners are still significantly more likely to report negative attitudes than other groups in most instances. Yet being young, which was once a predictor of positive attitudes to the welfare state, is now a fairly strong predictor of negative ones. This is a remarkable transformation. Arguably, one reason for this change could be that the youngest generation of adults hold culturally distinct values on a whole range of attitudes: from the economy and civil liberties to welfare and social justice. Young people are supposedly much more individualist than previous generations. So they are less swayed by arguments about the collective pooling of social and economic risks than, say, the baby-boomers born after the Second World War. Also, young people have been at the receiving end of some of the most high profile reforms and cuts to the broader system of state provision. The Education Maintenance Allowance – a seemingly popular and effective programme – was abolished, whilst tuition fees were trebled up to £9000 per year. Now the Conservatives are pledging to abolish Housing Benefit for the under-25s if they win the next general election. These two forces have created a potentially ‘perfect storm’. In this interpretation, the liberal, more individualistic outlook of younger people is strengthened and reinforced by a weakened stake in welfare provision. For people concerned for the legitimacy of the welfare state, evidence of changing youth attitudes raises question marks over how welfare can be defended. Evidence suggests that the contributory principle is favoured by older and more advantaged groups, so it might do little (if anything) to win over the young. Indeed, shifting even more resources towards established workers – as the contributory principle logically implies – may end up alienating young people even more. Instead, policy proposals should ensure much greater protection, support and opportunities to young people. A good start would be to defend the right of young people to social security benefits, as well as investing much more in supporting the often difficult and complex transition between full-time education and the labour market. Social security should also resonate with the particular cultural values that young people have: if younger people are more wedded to notions of personal freedom and autonomy than solidarity, social policies should take note. More support could be offered, for example, to young people who want to move new areas in search of jobs or training opportunities. The welfare state is not in the extreme state of crisis some politicians would have us believe – support for the broader principles of social security remains strong. But the capacity of the welfare state to tackle poverty and protect against social risks is reliant upon a strong degree of social legitimacy. 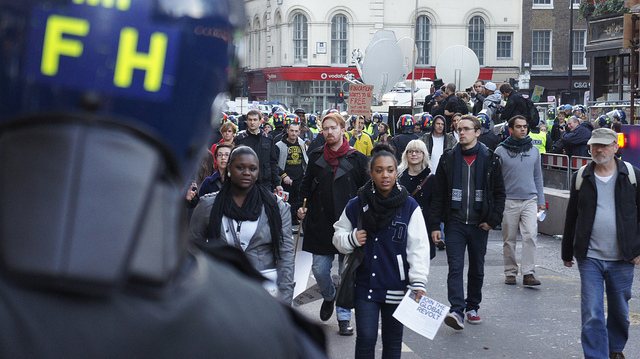 Understanding which groups have shifted their support – and why – is essential. For those who want to defend the welfare state, new and relevant ways must be found to make welfare work for the 21st century.